Amateur photographers do not need permission before using a tripod on Hampstead Heath but may be asked for personal details that could remain on a police database for seven years. 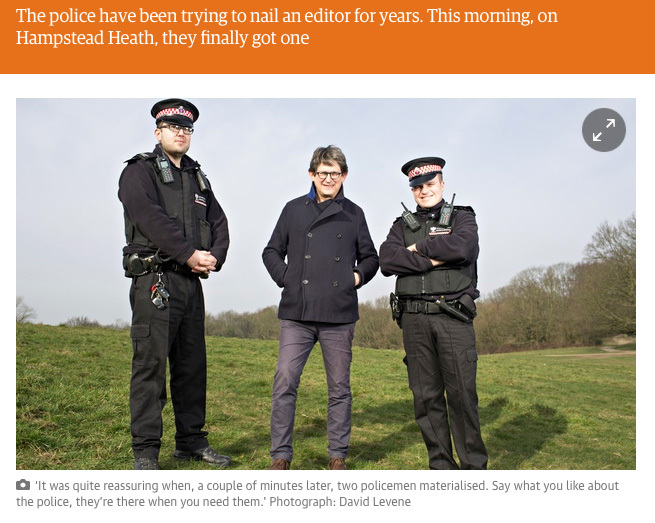 Hampstead Heath Constabulary has vowed to spell out the types of photography that require prior consent after Amateur Photographer (AP) sought clarity over enforcement of a 1932 by-law that ensnared Guardian editor Alan Rusbridger. City of London Corporation, which manages Hampstead Heath, yesterday said that ‘anyone is free to use tripods on Hampstead Heath as long as they get prior clearance’, to avoid falling foul of the by-law. Currently, any commercial photography and filming requires prior permission, with or without a tripod, according to rules published on the City of London Corporation website, where a fee applies. But ‘personal photography’ does not need prior clearance. However, the website guidelines make no mention of tripods, despite the 83-year-old by-law requiring all tripod users – both professional and amateur – to seek permission. Asked specifically about amateur tripod use, head of Hampstead Heath Constabulary Richard Gentry explained that officers do not expect them to seek permission before using a tripod. But he said there may be circumstances where an officer asks someone for their personal details if they have previously been seen using a tripod, for example. ‘He or she [the officer] may ask you for your name and address,’ he confirmed. Gentry explained that officers have, at their discretion, a number of ways of dealing with a breach of the Hampstead Heath by-laws, taking factors such as obstruction or commercial photography into consideration. Gentry used an analogy of someone caught driving at 85mph on a motorway where there has clearly been a breach of the 70mph speed limit, but where police may choose not to take action. He explained that if an amateur is on a pathway, with photographic equipment, then they would probably be asked to move on because they were causing a potential obstruction. However, if the photographer returned the next day, an officer may then decide to take their name and address details even if, on this occasion, they are in an open area away from pathways. Gentry said such details are recorded ‘to demonstrate who we are talking to and the type of incident we are dealing with’. He said it also helps officers monitor whether a photographer is taking pictures for commercial use on a return visit, having previously denied this, for example. Gentry told AP that a person’s details may be held on a ‘secure database’ for up to seven years, though these would be accessible only to Hampstead Heath Constabulary officers. Whether personal details are sought in the first place would depend on individual circumstances. Gentry stressed that an amateur would not be obliged to provide such details and – unlike the Guardian editor – they would not receive a written warning. He added: ‘I would expect my team to use common sense when dealing with photographers carrying camera apparatus. Gentry said he did not have information to hand on how many photographers have been stopped while using tripods over the past year. In response to enquiries by AP, Gentry said he plans to change the wording on the City of London Corporation website, to ‘make clear’ what types of photography require permission. The 1932 Hampstead Heath bylaw also prohibits improper language and practising gymnastics. Guardian editor Alan Rusbridger took responsibility for his photographer David Levene, who had been photographing him for an article on climate change. Meanwhile, Gentry urged amateur photographers who have a query about photography on Hampstead Heath to call him on 07768 808 426.